The drive was a breeze, actually literally… it was a breeze! We jumped in the truck and left the house at 5 am, sunroof open, windows wide. It was unseasonably warm for the middle of spring, we were loving it! The sun beat down the entire trip, music turned up and the air of angling excitement palpable. The drive to Algoma Country from any direction is a drive to be taken at one’s pace. All year long, it’s a drive that rivals Australia’s Great Ocean Road, or Highway 1 from San Fran to Big Sur. Picturesque, topographically dynamic, twisty turny and generally a ton of fun to drive. It didn’t take long, those 6 hours, door to door. As you turn onto Basswood Lake Rd, of which the name itself causes heart palpitations, you leave the smooth hum of highway 17 behind while the white noise of gravel under carriage takes over. Looking into the rear view, plumes of dust rise lingering like fog until the wind moves it to the forest, clearing the air for the next passenger. 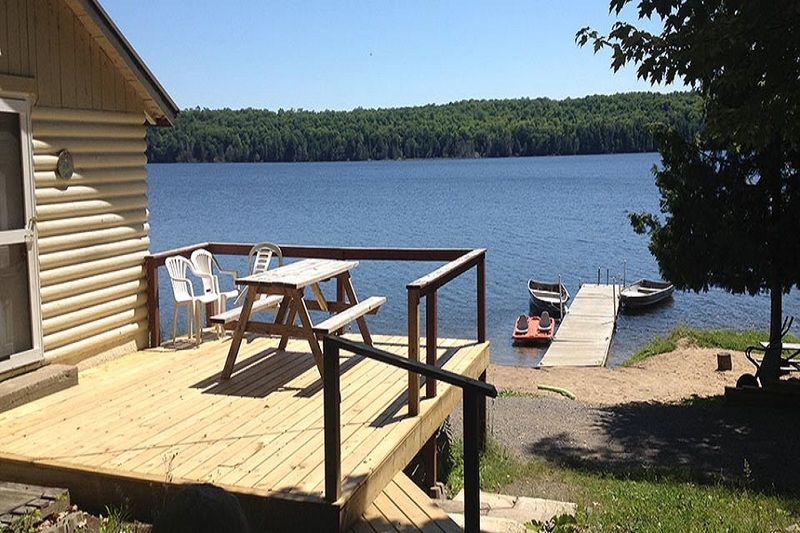 It isn’t long until you arrive, on your left to your rustic cabin, deck sitting two feet from the water’s edge, loons on the lake, water lapping on the shoreline and a horizon of green poplars and evergreens staring back at you from across Birch Lake. This resort is one of those secrets you want to let out, but really don’t want anyone else to know about. You want to introduce everyone to the jewel you’ve found yet can’t bear to share. 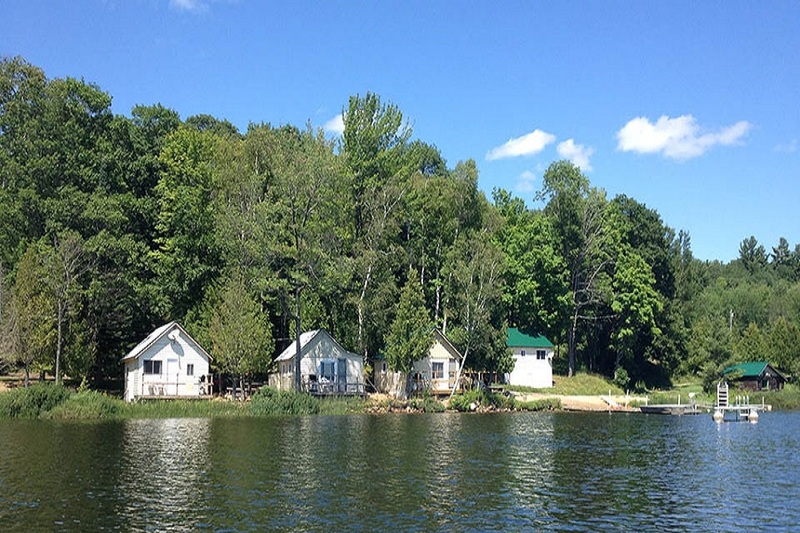 There isn’t anything overly special about the resort in itself, comfortable, clean cabins, with a kitchen, a fridge and stove, a well-used dining room table that screams poker with friends, or crazy 8’s with the kids, twin bed in one room and tri-bunks in the other. What makes this resort special is what lies in the surrounding area, what lies underneath. 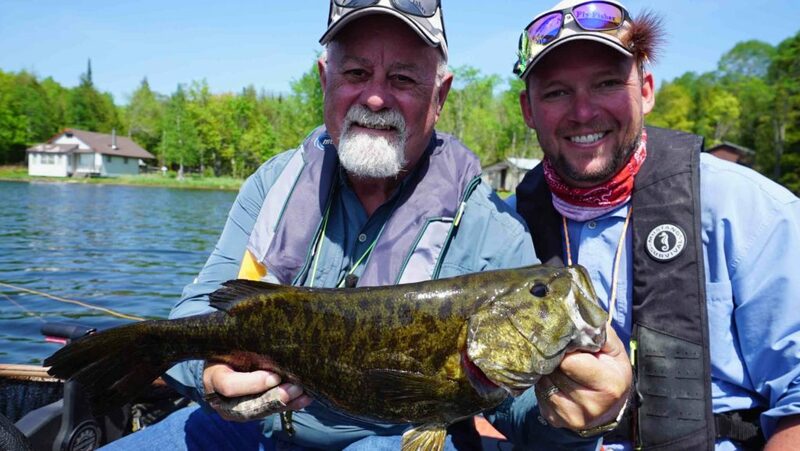 Northern Ontario Canada has a catch and release bass season outside of Bass regular fishing season in zone 7, north of Highway 17. 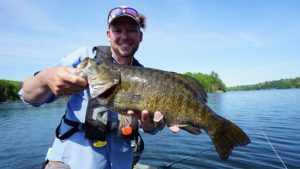 This means bass enthusiasts have the opportunity to target… and release fish while most, if not all of the province is out of season for angling bass. This region is special. 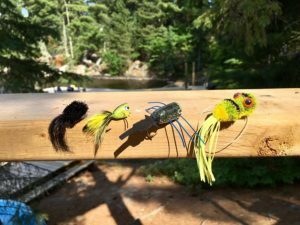 Think about bass fattening up for winter in the fall, catching them through the ice in the winter and targeting pre and post-spawn fish as they are aggressive and looking to feed heavily in the spring. We pulled into a bay which had deep water at its mouth and started casting. 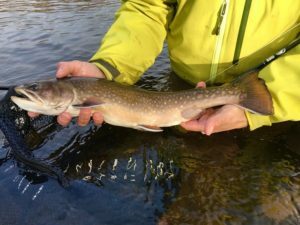 It wasn’t but a minute or two, we saw violent slashing on the surface, with what seemed to be minnows launching through the surface of the water attempting escape. We cast into the disturbance and were left in awe as we watched a giant fish attack the school of baitfish, its back coming clear out of the water. It was a smallmouth, it was a big one and it was hungry. We observed what was on the menu and did our best to match the size profile of our offering. 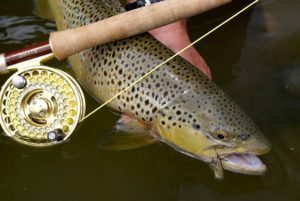 We nailed it, throwing flies into nervous minnows on the surface (nervous water) was the ticket. As soon as it happened, it changed – changed for the better! The bass that were bait balling the minnows went on the hunt searching for a more substantive meal. We witnessed fish cruising the flats and switched to top-water poppers. We managed to release at least 10 popper bass all in the 3-5 lb range before we decided to call it quits. What a first day we had in May! Our 2nd day in May, started out a little different. Big wind, whitecaps and slightly cooler temperatures, however, still very much shorts and t-shirts weather! Not to worry! Here, there’s a lake for that as well. We trucked it in, backed it down and off-loaded our boat to a new lake – to a new adventure. This time, we were looking for lee-shore calms with windy points. And I’ll tell you we found them! Sitting in the lee (calm area) behind a windy point, casting into the rough water payed back in spades. The result? Just a 7 lb smallmouth, followed by a 5 on another point then another 5 on a third point. It was what bass fishing dreams are made of. We continued our day fishing calm shallow back bays for cruising fish. I won’t tell you what we did on the water, just how we did… it was, hands down the finest day of smallmouth bass fishing both of us have ever had. Average size was 4 lbs with the big fish to end the day, a 6.5 lb smallmouth. So to recap, a 7, 6.5 and at least 2 five pound fish in a day? I have no words. 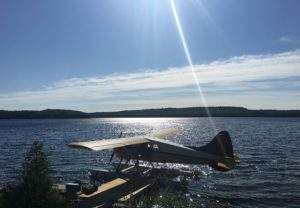 Birch Lake Resort was our home base for these 2 days in May. There, I said it. See, that’s the secret, we’re dying to tell, yet don’t want the word to get out… so please, please, don’t tell anybody!